A midwife is a healthcare provider of prenatal, birth and postpartum care for healthy women. 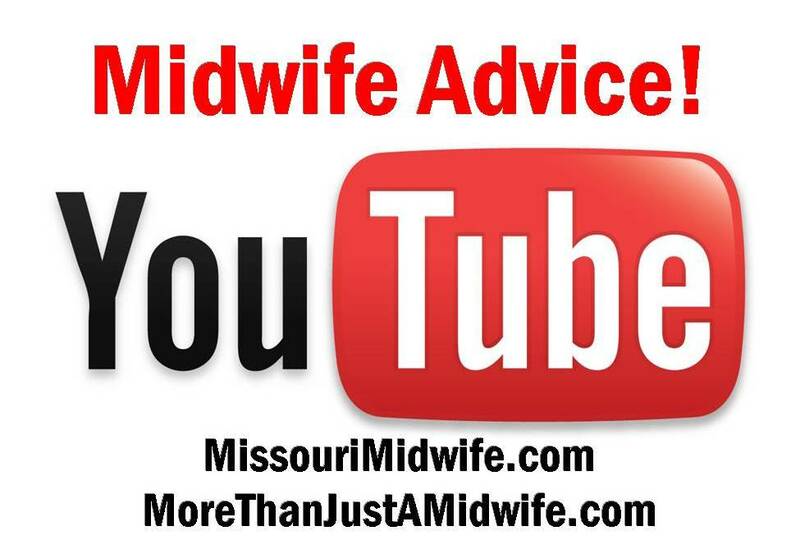 The word midwife means “with-woman,” a helper for the woman during pregnancy, birth and postpartum. Most midwives are women, but men can be midwives, too. Women helping women in childbirth has been the standard of care in childbirth since the beginning of the human race. In some parts of the world, there have been attempts to eradicate midwives while other parts of the world have an unbroken tradition of midwifery with skills handed down from midwife to apprentice for generations. Although midwives do a lot of the same things an obstetrician or other doctor may do, like checking blood pressure, measuring the baby, listening to the heartbeat, and attending the delivery, midwives do so in a more personal way. 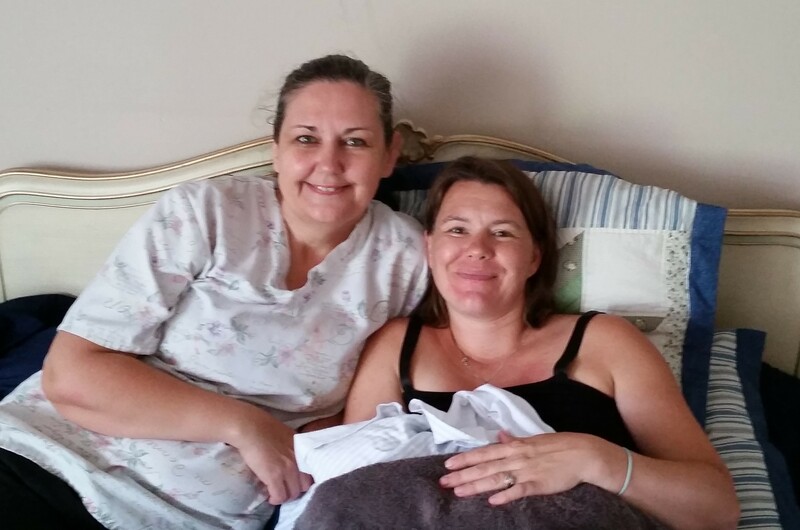 Midwives spend an average of one hour per prenatal visit with her client, so when the time comes for birth, they know each other very well. 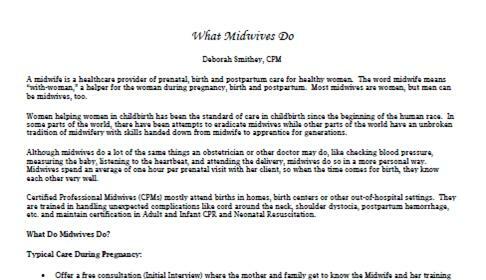 Certified Professional Midwives (CPMs) mostly attend births in homes, birth centers or other out-of-hospital settings. They are trained in handling unexpected complications like cord around the neck, shoulder dystocia, postpartum hemorrhage, etc. and maintain certification in Adult and Infant CPR and Neonatal Resuscitation. In my practice, I prefer to use my hands and simple tools for most routine examinations, reserving the use of technology to assist only when necessary. For example, I palpate (feel with my hands) the mother’s abdomen to determine the baby’s position and estimate the size of the baby. If I have a doubt about my findings by palpation and we need to know the position for sure, I refer the mother for an ultrasound. Once I was palpating a 19-week baby and felt sure the baby was breech with its back facing towards the mother’s back-left. The baby’s position at 19 weeks is not important, because baby will change positions many times before birth. But this woman was going to her ultrasound appointment immediately following her prenatal visit with me, so it was a good test of my palpation skills. I asked her to text me the baby’s position as soon as she found out. I was right! Of course, I cannot always determine the position for sure, especially at 19 weeks, but it was fun to have verification that my palpation skills are good! •	Offer a free consultation (Initial Interview) where the mother and family get to know the Midwife and her training and experiences. •	Provide women and families with written disclosure of the midwife’s education, training, years of experience, number of women assisted, outcomes and statistics for her practice, list of risk factors and emergency back-up plan. •	Support Families and their decisions. •	Screen for “high risk” or complications. •	Consultation and referral to another health care provider when indicated. •	Access to extensive lending library and videos. •	Remain available to the family via phone, pager or mobile phone throughout pregnancy. •	One hour prenatal visits, monthly at first, increasing in frequency as pregnancy advances. •	Getting to know the family and their needs. •	Measure fundal height (measuring growth). •	Palpation to assess baby’s position. •	Listening to baby’s heart tones. •	Monitor Baby’s heart tones frequently and keep an eye on Mom’s vital signs. •	Keep Mom well fed and hydrated. •	Let labor progress on Mom’s timetable. •	Make sure Family is cared for. •	Assessment of cervical dilation. •	Observance of the situation so when something abnormal occurs it is recognized immediately. •	Use of warm compresses during pushing. •	Give encouragement and suggestions as needed. •	Immediate skin to skin contact for Mom & Baby. •	Continue to monitor Mom and Baby’s vitals. •	Check the uterus to verify that it is contracting as it should after the birth. •	Make sure that Family is fed. •	Make sure birth site is returned to original state. •	Newborn examination within two hours of birth. •	Stay as long as needed after placenta has been born and Mom and Baby are both stable. •	Make sure there is adequate household help. •	Revisit home between 24-48 hours and again at 7-10 days, or more if indicated. •	Intermittently monitor Mom and Baby’s vitals. •	Help mom and baby establish a successful breastfeeding relationship. •	Postpartum visits at 3 weeks and again at 6 weeks, or more if indicated. •	Continue to remain available to your family via phone or pager for the 1st 6 weeks postpartum. •	Practice Medicine! However, midwifery and medical practices may include some of the same procedures. •	Prescribe drugs or administer narcotics. •	Interfere with normal labor and birth. •	Attend “high risk” births or perform cesarean section surgery. •	Use continuous electronic fetal monitoring (EFM). Monitoring often leads to partial or total restriction of movement which can domino into more pain due to lack of freedom to assume a better position and/or trouble with the baby descending properly, which is often aided by movement. Use of continuous EFM during labor has not been shown to improve outcomes when compared with intermittent fetal monitoring with fetoscope or hand held Doppler. •	Offer drugs for pain relief like Epidurals, which can lower the mother’s blood pressure too much, decreasing the amount of oxygen for the baby, and increasing the risk of fetal distress. •	Routinely offer internal exams late in pregnancy. •	Routinely cut episiotomies. Episiotomies increase the risk of major tears and usually require many more stitches than a natural tear. Episiotomies have a higher rate of infection and a higher rate of serious complications. •	Tell a Mother where, how and in what position she must push. •	Make Mom lie flat on her back during labor or pushing. This is physically bad for baby because it restricts blood flow to the pelvic region, reducing or cutting off the baby’s oxygen supply and has been shown to be associated with fetal distress. •	Use forceps or vacuum extractors. •	Withhold food and drink.